You're not buying whole companies, but you can still apply the Oracle of Omaha's acquisition criteria to picking stocks. Warren Buffett is known for his long history of acquiring excellent businesses at reasonable prices. Buffett and the rest of the Berkshire Hathaway (NYSE:BRK-A) (NYSE:BRK-B) team are always on the lookout for new acquisitions. They've even put their acquisition criteria right in the middle of Buffett's annual letter to Berkshire's shareholders. And while it's unlikely that you have a $5 billion business you'd like to sell to him, you can still learn some valuable lessons from this information. With that in mind, here's what Buffett looks for when shopping for acquisitions, and how you can apply similar principles when buying stocks. According to Buffett's 2014 letter to Berkshire Hathaway's shareholders, these are the six characteristics he looks for in a potential acquisition target. Large size, defined as a company with at least $75 million in annual pre-tax earnings. Consistent earnings power – and it must be proven, not just future projections. Good returns on equity with little or no debt. Management already in place -- Berkshire will not replace or provide management. A simple business -- meaning one that is easy to understand. He went on to add that he can tell those parties interested in selling their business within five minutes whether or not Berkshire would be interested. In other words, Buffett and company have a specific profile in mind, and are unwilling to accept anything less. While some of these are inapplicable to individual investors like you and me, others are great principles to apply to any stock you're considering. Obviously, the last item on the list, a known offering price, isn't a concern for investors like you and me. You can know the price of your investment simply by obtaining a stock quote. First, I generally gravitate toward large companies to invest in -- usually with market caps of $5 billion or more. Larger companies simply tend to be more established and stable. However, this is not a set-in-stone requirement -- I'll gladly consider a smaller company that meets the other criteria mentioned here. There are plenty of small-cap companies with good management, low debt, and consistent profitability. Consistent earnings power is also extremely important to me. 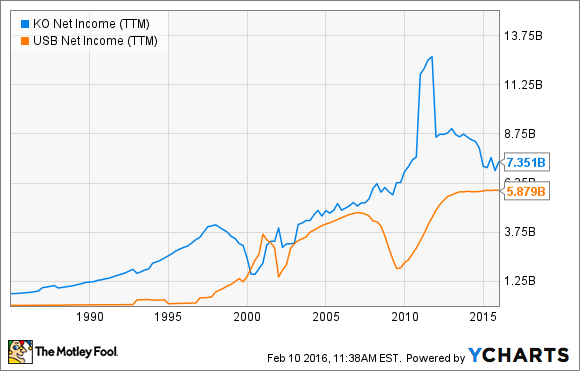 For example, look at the net income growth of favorite Buffett stocks Coca-Cola (NYSE:KO) and US Bancorp over the past few decades. Sure, it's not a straight line for either company -- after all, recessions happen, and not every quarter can be better than the last -- but there is a long and clear upward trajectory for both companies. They've shown a proven ability to profit in good times and bad, and to grow those profits over time. It's also important to choose companies whose debt loads are small -- or, more specifically, whose interest expenses are small. In 2015, Coca-Cola earned an operating profit of $8.73 billion while incurring only $856 million in interest expenses. In other words, for every dollar in profit, Coca-Cola spent less than $0.10 paying interest on its debt. Light debt loads like this allow the company to remain profitable even if revenues fall as the result of a market crash or other economic weakness. Further, note that Buffett simply said he wants "management in place," which is perhaps the biggest understatement on the list. While Buffett absolutely likes to give the management of each of his subsidiaries as much freedom to operate as possible, he also places tremendous value on great managers. Signs of shareholder-friendly managers at a company include a history of smart debt management, liberal return of capital to investors, and managers/directors who are highly invested in the company's success. On the topic of management, Buffett also likes to look for businesses where the managers don't have to do too much to keep the company profitable. Why? CEOs and other managers change from time to time -- the management team in place today is likely to be much different than the management 10 or 20 years from now. Buffett has said that one reason he loves Coca-Cola as an investment is that a "ham sandwich" could run the company. While this may be a bit of an exaggeration, the point is that Coca-Cola basically runs itself. The same can be said for many of the businesses Buffett buys. Finally, you don't necessarily need to narrow your search to "simple" businesses, but it's a smart idea to invest in what you know. In Buffett's case, he won't touch any tech companies, as he says he wouldn't understand the business and therefore couldn't make a truly informed investment decision. For the same reason, I stay away from biotech stocks -- I'm sure there are a lot of good ones, but I understand banking, energy, and technology companies better, so I stick to those. These are just a few pieces of the puzzle to finding great stocks to invest in -- there are many other factors to consider, such as valuation, competitive advantages, and dividend history. However, Buffett's acquisition criteria can certainly get you pointed in the right direction.